As you might imagine, we get all sorts of unsolicited email coming in. Some of it isn’t related to what we cover here, and some of what would be related is, well, just stuff we opt not to cover, for any of a number of reasons. 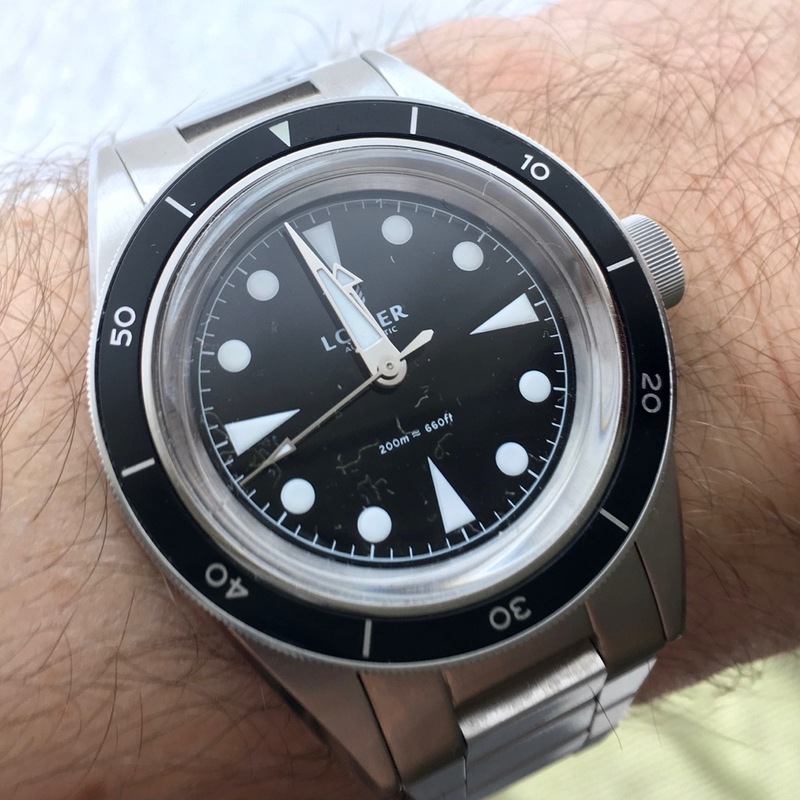 However, there are gems that pop through now and again, and the arrival of watches like the Lorier Neptune is what keeps me reading those emails. So, who is Lorier, you ask? It’s a new brand starting up in Texas, run by a husband-wife team who, in their day jobs, are public school teachers in Houston. So, you then ask, why this watch? On one hand, it’s a story we’ve heard before – they like vintage watches, they like going on adventures, and wanted something they could reasonably take out without worry about damaging the vintage goods. That led, then, to the creation of the Lorier (pronounced Loryé) Neptune. Right off the bat, many of you are likely going to pick up on the vintage inspirations for the watch. The brand itself calls out the 6538 Submariner, the CK2913 Seamaster, the Seiko 62MAS. I’ll leave it to you for how you feel about those implementations. For me, I felt that it all worked well together – definitely having that vintage vibe, but not being a homage to just a single watch. The vintage feel of the Lorier Neptune starts with the “super dome” plexiglass crystal. Whenever I see this crystal shape, it puts me in mind of an older watch, and I like how it warps light at the bend. Under the crystal, you of course have the identifiably vintage-Seamaster handset spinning over what (to my mind) seems to be a Rolex-inspired dial. Wrapped around all of those is a 120-click bezel with an aluminum insert. This insert held a pleasant surprise. When I was getting some lume shots of the Lorier Neptune, I realized that the triangle on the insert was lumed. I had originally just thought it to be a flat printed insert, but I was wrong. That’s just the sort of small details that help to elevate the watch, sort of like the polished edges that show up here and there, giving a bit of flash to the otherwise brushed finish. The bracelet of the Lorier Neptune is also sort of it’s own character. It’s not “yet another” Oyster bracelet clone. The solid links on it are very flat, and individually almost have the feel of being half links. Also fun but unintended – if you play with the bracelet, the way the links fold call to mind a tank tread. I will call out that the threads on the links (and the pins) are shallow. Once unscrewed, it almost doesn’t look like the pins are sticking out enough – you’ll need to use a pair of jewelers pliers to grab a hold of them to pull them out. The thread depth didn’t seem to make the bracelet become jangly or insecure, but you might want to think about a dab of thread locker if you’re adjusting your own. Sizing on the Lorier Neptune also brings that vintage feel. Sure, the 39mm case would be large by 50 year old watch standards, but for today, it feels small (on the spec sheet). On the wrist, I thought it fit quite nice. Add in the relatively-thin profile (12mm, plus the crystal) and 20mm bracelet, and you’ve got a more compact piece. Which, again, fits that vintage profile they’re going for. As you should expect, I wore the Lorier Neptune across a variety of settings, and it worked well. It may not have quite enough polish for, say, a black tie affair, but short of that, it should work everywhere. So, the brand definitely accomplished that goal. This all being on the bracelet. They also have a variety of textile straps that could give you more of that “adventure-ready” feel. And if you’re carrying some of those options with you, the standard packaging is likely along for the ride as well. Rather than some wooden box that will get shelved or tossed, they’ve developed a leather pouch with a snap enclosure. If you’re the sort to change straps, that would be a good place to store them and a changing tool on the road (or just a second watch, if so inclined). So, how much would you pay for this watch? Well, consider the all-steel construction, and the fact that it houses a NH35A automatic movement in. So, yeah, now you know we’re in affordable territory. And, with the price being set at $389, the Lorier Neptune is very, very affordable. The watch is currently up for pre-order. The pre-order will close out just before shipping commences (anticipated for May 2018). While pricing won’t change, you can get a bonus strap (using the code NEPTUNE01) if you do pre-order your watch (dial options are black or blue). Previous articleThe Citizen ProMaster Diver Limited Edition BN0141-53E – I want a perfect body. I want a perfect soul. Next articleSeals Watch Co. Dark Seal: The Perfect Tool Watch?